I am born and raised in British Columbia, but shamefully have not explored my home turf much at all. When a chance came up to visit Lake Louise and Banff, I jumped on it. 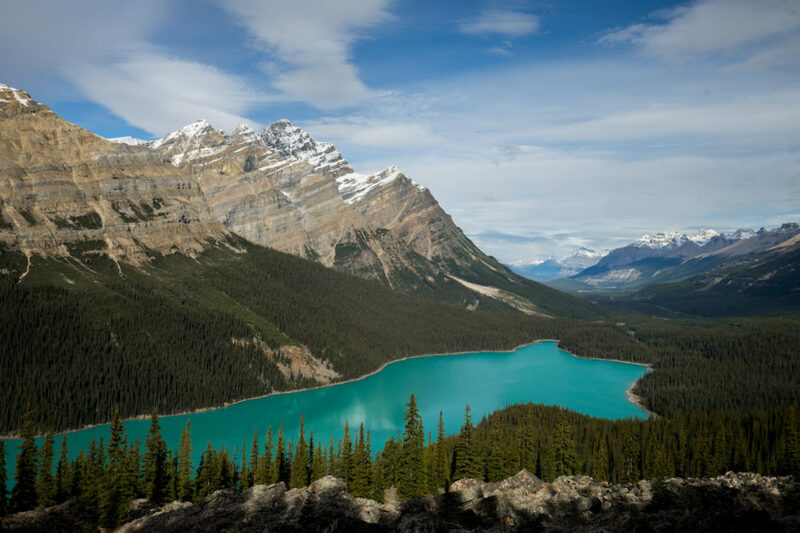 Not only was it to visit this region — which is in Alberta, right at the BC border — but it was to arrive by train on the Rocky Mountaineer. As a photographer and as a rational human being, there was no way I would turn down this trip. I chose to arrive at the start of fall rather than the height of summer. It proved to be one of the best decisions I could have made. 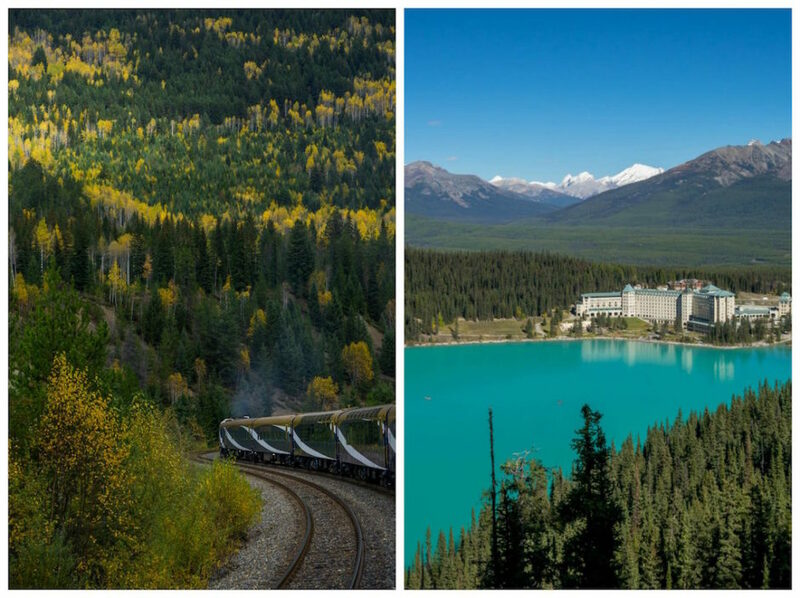 I had the intense pleasure of arriving to the Rockies by train aboard the Rocky Mountaineer. Traveling by train after years of being crammed into coach kind of was a dream: humming along the track, landscape whisking by, watching Vancouver's city turn to suburbs and turn into valleys, then rolling farmland and ranching, before jetting along rapids and watching the hills roll back into mountains, and finally carve (literally carve) through the Rockies as we approached Alberta. There was the added bonus of watching the fall colours show up, and become more and more intense as we gained elevation. And then, arriving to the famous Fairmont Lake Louise. I mean, come on, it's the Fairmont and probably their most famous location. Bucket list – check. 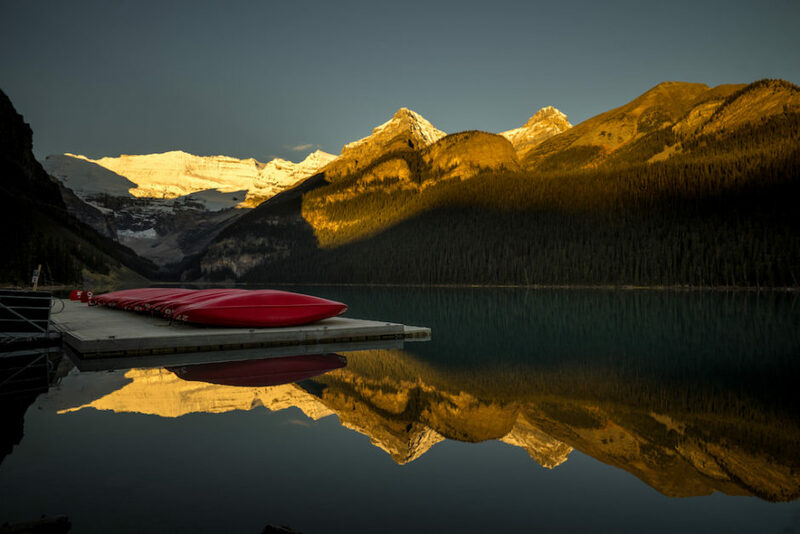 While it's tempting to stay tucked in, sunrise at Lake Louise is something else. I melted out of my high thread count sheets and sleepily plunked down on the rocks in the dark. I was second guessing this decision until the peak went fiery orange. To watch the valley essentially catch fire – and that glacier sure picks up colour being white – was well worth the pain of an early rise. A really popular climb along Lake Louise is up to the Teahouse. Just past the Teahouse is Lake Agnes. Even just with this slight elevation (it didn't feel slight to my legs) there was more and more yellow larch as we went. 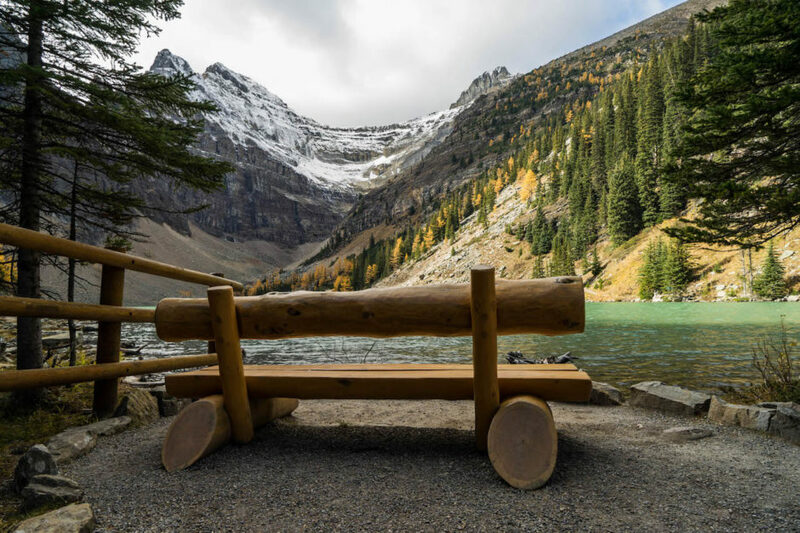 It's not a bad place to rest your weary calves before heading onward, to the Plain of Six Glaciers, or back down. With extra days to spare I had the chance to catch other lakes at sunrise. 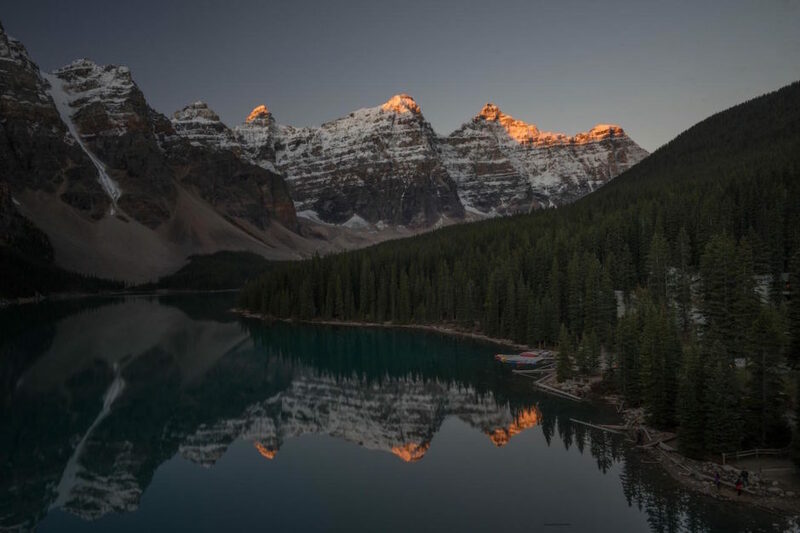 Moraine Lake, not too far from Lake Louise, was the best – the reflection, the canoes, the vantage points, the lack of tourists (though not lack of other early bird photographers). And that fall sunrise, it's sheer perfection. Deeply orange, slow moving, late arriving (dawn in the summer is a doozy), and wrapping around those mountain caps like a warm hug – it's well worth the drive. Bring a blanket – the air is chilly, though nothing like the winter days to come. 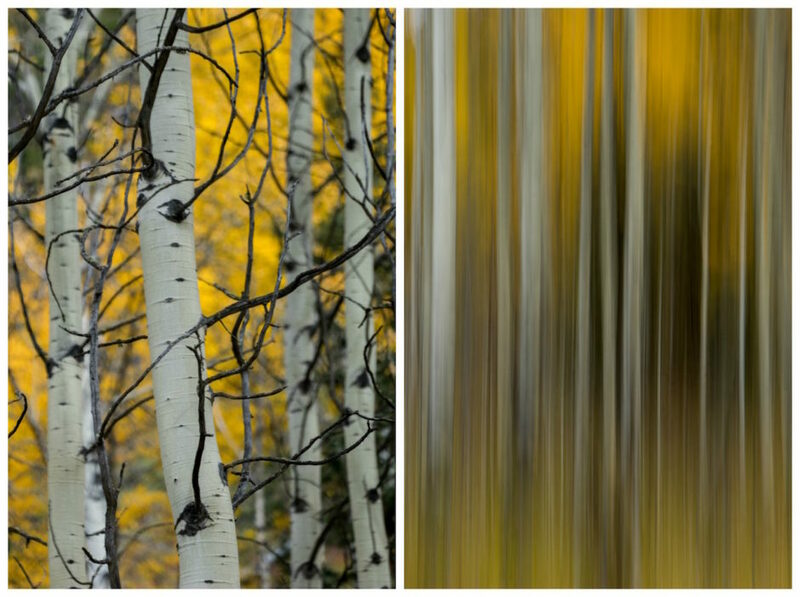 The yellow of the larch draws photographers every year to these mountains, and rightly so. They're cheerful, bright, bold, and speckled all over the hills, mountains, valleys, rivers, and along the roads. Swaths of these yellow larch trees cropped up on mountains all around us – like this one as we left Moraine Lake. It's hard to explain why this little explosion of colour is so enticing – perhaps it's the stark contrast to all the green, or the softness of the yellow next to a jagged peak. Personally I think it's the quality of the fall light, as it marries the yellow of the larch. It's like the light, or the trees, or both, just come alive. 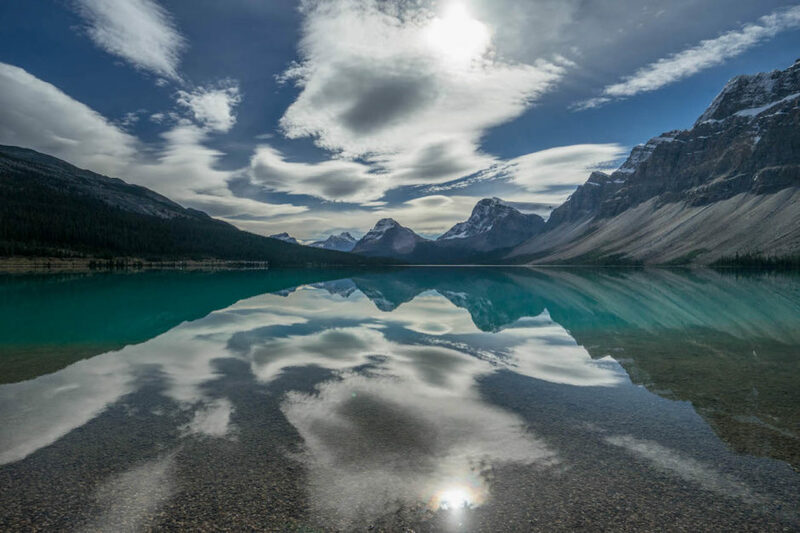 Peyto is located along the Icefields Parkway. 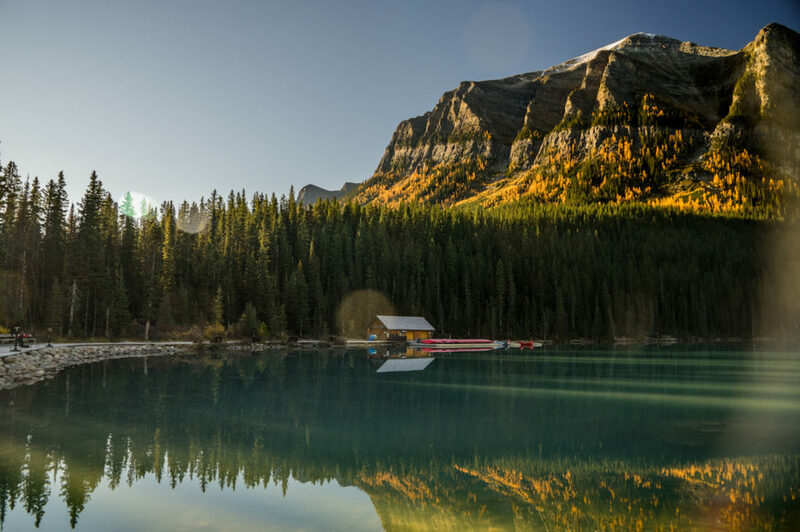 It's a popular spot, but visiting in the fall gives advantages similar to Lake Louise – less tourists, beautiful, soft, hazy light, and more clarity here as you peer down a valley of giants than in the humidity of summer. This particular fall day brought little to no wind. It was calm and clear as we arrived to Bow Lake, which I was told is normally pretty choppy. Not today – I had a chance to see this wide, shallow, less blue but extremely clear lake with still waters. The mirroring effect was captivating, and a treat to photograph. While you might get a calm day in the summer, you may not get calm tourists who seem to love chucking rocks to the chagrin of photographers (or those just looking on and taking it in). This day there was perhaps 6 people there, and I was grateful for that. 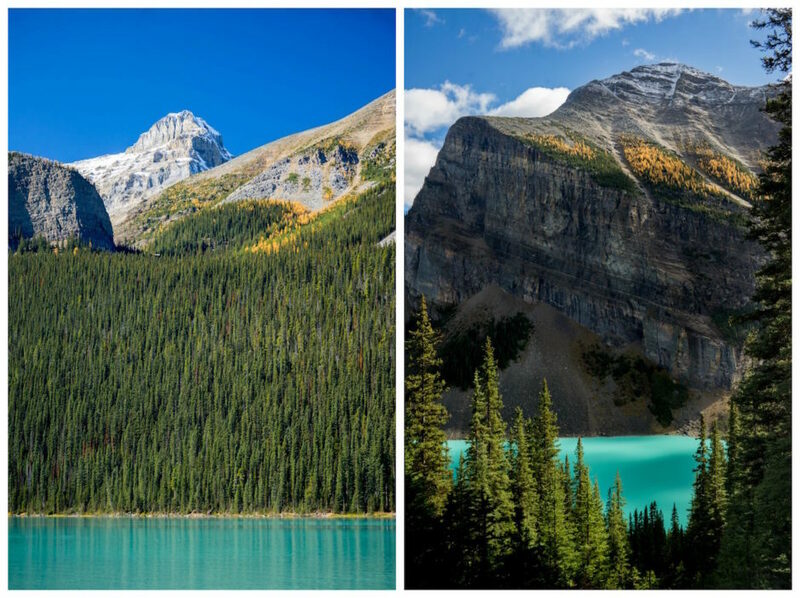 While Lake Louise and the Icefields Parkway are pretty epic, don't discount Banff. The fall colours around here were intense, and the scenery equally so. 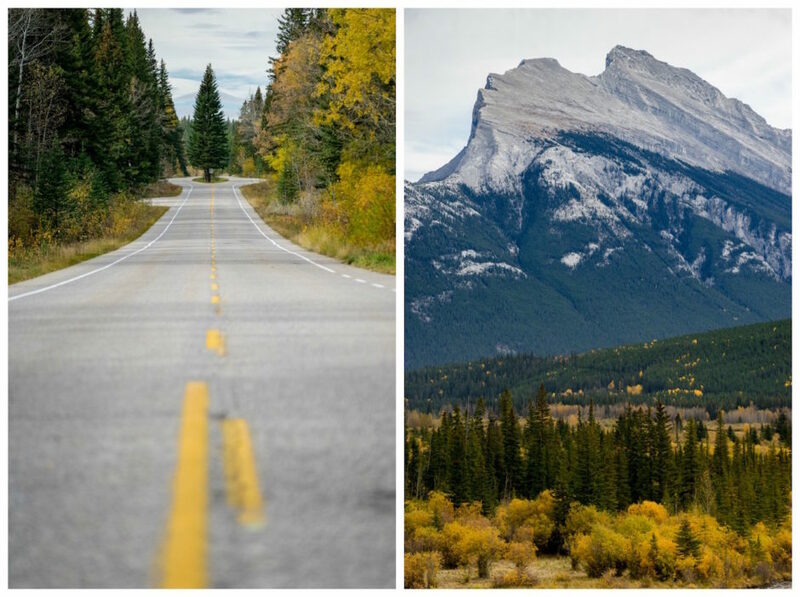 The Vermilion Lakes area was speckled with yellow all over, as was the Bow Valley Parkway. Don't think you have to hike far to see fall colours here – much of it can be enjoyed roadside and from really easy viewpoints. In case I didn't hammer it home, coming for the yellows of fall is a great idea, but it's the fall light that was driving me crazy (in a good way). Sunrise to sunset it had that hazy, delicious, nostalgic feeling. Not that I'd ever been to these places before (so I had nothing to be nostalgic about) but it was a pre-nostalgia: that pang in the chest when you just know one day down the road you'll miss this place and this time. Standing on the edges of giants and watching the sun come up and pour out and light peaks and trees and lakes ablaze, it simply didn't get old and never could.